Is there a better way of keeping track of users you want to follow than just visiting their page manually every time? I've found I enjoy looking at various users' posts and the list of usernames/names to remember is reaching the limits of my memory. I am not a twitter user or anything but I can see why you may want to have a 'follow' feature and then a 'friends' tab to view their activity. Scroll to the bottom of the user profile and check the link user feed to obtain an RSS feed. I was pondering the same question recently, and tried the user RSS feed, but found it too noisy/stalkish. I don't need to read every comment left by the user, especially since comments show up without context. What I wanted was the list of recent, unanswered questions posted by "whitelisted" users: those whom I identified as reliable posters of decent questions in areas of interest to me. An initial approximation to the list of users was obtained with the query Users whose questions you have answered. It's an interesting query to run even if you don't plan on using the filter described below. gives the list of up to 100 (the pagesize parameter) unanswered (in the SE sense) questions asked by the specified users (Id numbers 12345 and 76543), sorted by last activity. One can also narrow down the search by replacing unanswered with no-answers, or expand it by dropping unanswered altogether. The list of users can have up to 100 semicolon-separated Id numbers. 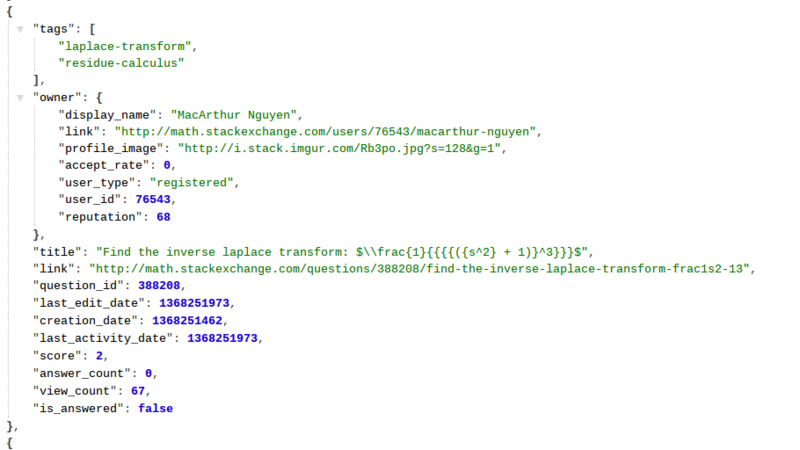 But having installed the Chrome extension JSON Formatter, I found JSON output almost as readable as SE pages. The long lines with green text are all I need to read, and the link field is clickable. Of course, the proper way to use this functionality would be to write a script that inserts the data into an actual HTML page. 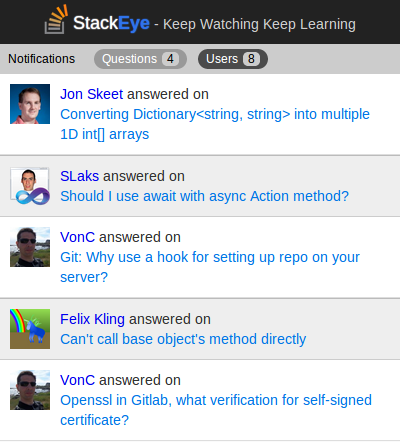 Although not see on the screenshot, questions asked by followed users are also included in notifications. Is there any way by which we get the information if any particular user adds any Q/A. Is there a way to follow users? 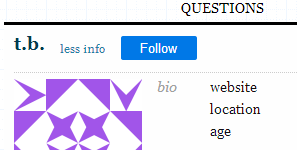 Is there a way to follow answerers? Is it possible for this site to get some sort of “best of” feature to compile classic answers? Could those named “User XXXX” please consider changing their names to something more distinctive? Is there need to patrol for deleted questions? Is it possible to create nested lists? Numbered lists interspersed with commentary.